Mercifully look down on thy people, we beseech thee, O Almighty God, that, by thy bounty and protection, they may be governed and guarded, both in body and soul. Through our Lord Jesus Christ, thy Son, who liveth and reigneth with thee, in the unity of the Holy Ghost, God, world without end. Amen. Against the Persecutors of the Church. Mercifully hear, we beseech thee, O Lord, the prayers of thy Church: that, all oppositions and errors being removed, she may serve thee with a secure liberty. Through our Lord Jesus Christ, thy Son, who liveth and reigneth with thee, in the unity of the Holy Ghost, God, world without end. Amen. O God, the Pastor and Ruler of all the Faithful, look down, in thy mercy, on thy servant <Gregory XVIII>, whom thou hast appointed Pastor over thy Church; and grant, we beseech thee, that both by word and example, he may edify all those that are under his charge: and, with the flock intrusted to him, arrive at length at eternal happiness. Through our Lord Jesus Christ, thy Son, who liveth and reigneth with thee, in the unity of the Holy Ghost, God, world without end. Amen. To-day, if ye shall hear the voice of the Lord, harden not your hearts. This is our reason for drawing the attention of our readers to certain beauties of the Divine Office, which would otherwise be totally ignored. Thus, what can be more impressive than this solemn Invitatory of to-day's Matins, which the Church takes from one of the psalms, and which she repeats on every Feria between this and Maundy Thursday? She says: To-day, if ye shall hear the voice of the Lord, harden not your hearts! The sweet voice of your suffering Jesus now speaks to you, poor sinners! be not your own enemies by indifference and hardness of heart. The Son of God is about to give you the last and greatest proof of the love that brought him down from heaven; his Death is nigh at hand: men are preparing the wood for the immolation of the new Isaac: enter into yourselves, and let not your hearts, after being touched with grace, return to their former obduracy,—for nothing could be more dangerous. The great anniversaries we are to celebrate have a renovating power for those souls that faithfully correspond with the grace which is offered them; but they increase insensibility in those who let them pass without working their conversion. To-day, therefore, if you hear the voice of the Lord, harden not your hearts! In them, therefore, was fulfilled that terrible saying: He that shall speak against the Holy Ghost, it shall not be forgiven him, neither in this world, nor in the world to come (St. Matth, xii. 32). The Synagogue is nigh to a curse. Obstinate in her error, she refuses to see or to hear; she has deliberately perverted her judgment: she has extinguished within herself the light of the Holy Spirit; she will go deeper and deeper into evil, and at length fall into the abyss. This same lamentable conduct is but too often witnessed now-a-days, in those sinners, who, by habitual resistance to the light, end by finding their happiness in sin. Neither should it surprise us, that we find in people of our own generation a resemblance to the murderers of our Jesus: the history of his Passion will reveal to us many sad secrets of the human heart and its perverse inclinations; for what happened in Jerusalem, happens also in every sinner's heart. His heart, according to the saying of St. Paul, is a Calvary, where Jesus is crucified. There is the same ingratitude, the same blindness, the same wild madness, with this difference,—that the sinner who is enlightened by faith, knows Him whom he crucifies; whereas the Jews, as the same Apostle tells us, knew not the Lord of Glory (I Cor, ii. 8). Whilst, therefore, we listen to the Gospel, which relates the history of the Passion, let us turn the indignation we feel for the Jews against ourselves and our own sins: let us weep over the sufferings of our Victim, for our sins caused him to suffer and die. Everything around us urges us to mourn. The images of the Saints, the very crucifix on our Altar, are veiled from our sight. The Church is oppressed with grief. During the first four weeks of Lent, she compassionated her Jesus fasting in the desert; his coming Sufferings and Crucifixion and Death are what now fill her with anguish. We read in to-day's Gospel, that the Jews threaten to stone the Son of God as a blasphemer: but his hour is not yet come. He is obliged to flee and HIDE himself. It is to express this deep humiliation, that the Church VEILS the Cross. A God hiding himself, that he may evade the anger of men,—what a mystery! Is it weakness? Is it, that he fears death? No,—we shall soon see him going out to meet his enemies: but, at present, he hides himself from them, because all that had been prophesied regarding him has not been fulfilled. Besides, his death is not to be by stoning; he is to die upon a Cross, the tree of malediction, which, from that time forward, is to be the Tree of Life. Let us humble ourselves, as we see the Creator of heaven and earth thus obliged to hide himself from men, who are bent on his destruction! Let us go back, in thought, to the sad day of the first sin, when Adam and Eve hid themselves because a guilty conscience told them they were naked. Jesus is come to assure us of our being pardoned! and lo! he hides himself, not because he is naked,—He that is to the Saints the garb of holiness and immortality,—but because he made himself weak, that he might make us strong. Our First Parents sought to hide themselves from the sight of God; Jesus hides himself from the eye of men; but it will not be thus for ever. The day will come, when sinners, from whose anger he now flees, will pray to the mountains that they fall on them to shield them from his gaze; but their prayer will not be granted, and they shall see the Son of man coming in the clouds of heaven, with much power and majesty (St. Matth, xxiv. 30). This Sunday is called I Sunday of the Passion (Passion Sunday), because the Church begins, on this day, to make the Sufferings of our Redeemer her chief thought. It is called also, Judica, from the first word of the Introit of the Mass; and again, Neomania, that is, the Sunday of the new (or, the Easter) moon, because it always falls after the new moon which regulates the Feast of Easter Day. In the Greek Church, this Sunday goes under the simple name of the Fifth Sunday of the Holy Fests. During Passion Week, a Saint’s Feast, if it occur, will be kept; but I Sunday of the Passion (Passion Sunday) admits no Feast, however solemn it may be; and even on those which are kept during the days intervening between Passion and Palm Sundays, there is always made a commemoration of the Passion, and the holy Images are not allowed to be uncovered. The severity of the Lenten Fast is increased during these it’s last days; the whole energy of the spirit of penance is now brought out. 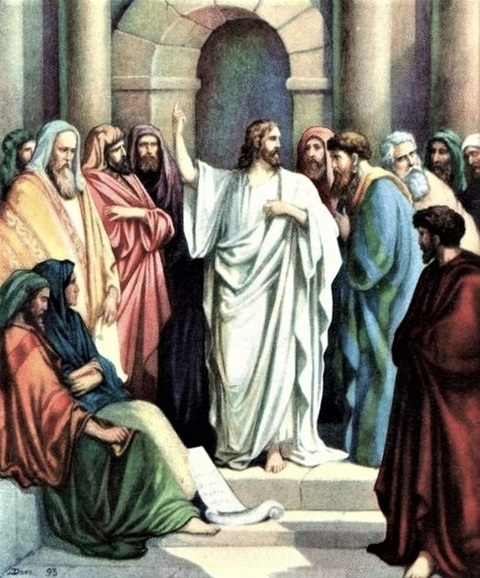 At that time: Jesus said to the multitude of the Jews: Which of you shall convince me of sin? If I say the truth to you, why do you not believe me? He that is of God, heareth the words of God. Therefore, you hear them not, because you are not of God. The Jews, therefore, answered, and said to him: Do not we say well that thou art a Samaritan, and hast a devil? Jesus answered: I have not a devil; but I honour my Father, and you have dishonoured me. But I seek not my own glory: there is one that seeketh and judgeth. Amen, amen, I say to you: If any man keep my word, he shall not see death for ever. The Jews therefore said: Now we know that thou hast a devil. Abraham is dead, and the prophets; and thou sayest: If any man keep my word, he shall not taste death for ever. Are thou greater than our Father Abraham, who is dead? And the prophets are dead. Whom dost thou make thyself? Jesus answered: If I glorify myself, my glory is nothing. It is my Father that glorifieth me, of whom you say that He is your God; and you have not known him, but I know him. And if I should say that I know him not, I should be like to you, a liar. But I do know him, and do keep his word. Abraham your father rejoiced that he might see my day: he saw it, and was glad. The Jews then said to him: Thou art not yet fifty years old, and hast thou seen Abraham? Jesus said to them: Amen, amen, I say unto you, before Abraham was made, I AM. They took up stones therefore to case at him. But Jesus hid himself, and went out of the temple. The fury of the Jews is evidently at its height, and Jesus us obliged to hide himself from them. But he is to fall into their hands before many days are over; then will they triumph and put him to death. They triumph, and Jesus is their victim; but how different is to be his lot from theirs! In obedience to the decrees of his heavenly Father, and out of love for men, he will deliver himself into the hands of his enemies, and they will put him to death; but he will rise victorious from the tomb, he will ascend into heaven, he will be throned on the right hand of his Father. His enemies, on the contrary, after having vented all their rage, will live on without remorse, until the terrible day come for their chastisement. That day is not far off, for observe the severity wherewith our Lord speaks to them: You hear not the words of God, because you are not of God. Yet there was a time, when they were of God, for the Lord gives his grace to all men; but they have rendered this grace useless; they are now in darkness, and the light they have rejected will not return. You say, that my Father is your God, and you have not known him; but I know him. Their obstinacy in refusing to acknowledge Jesus as the Messais, has led these men to ignore that very God, whom they boast of honouring; for if they knew the Father, they would not reject his Son. Moses, and the Psalms, and the Prophets, are all a dead letter to them; these sacred Books are soon to pass into the hands of the Gentiles, who will both read and understand them. If, continues Jesus, I should say that I know him not, I should be like to you, a liar. This strong language is that of the angry Judge who is to come down, at the last day, to destroy sinners. Jerusalem has not known the time of her visitation: the Son of God has visited her, he is with her, and she dares to say to him: Thou hast a devil! She says to the Eternal Word, who proves himself to be God by the most astounding miracles, that Abraham and the Prophets are greater than He! Strange blindness, that comes from pride and hardness of heart! The Feast of the Pasch is at hand: these men are going to eat, and with much parade of religion, the flesh of the figurative lamb; they know full well, that this lamb is a symbol, or a figure, which is to have its fulfillment. The true Lamb is to be sacrificed by their hands, and they will not know him. He will shed his Blood for them, and it will not save them. How this reminds us of those sinners, for whom this Easter promises to be as fruitless as those of the past years! Let us redouble our prayers for them, and beseech our Lord to soften their hearts, lest trampling the Blood of Jesus under their feet, they should have it to cry vengeance against them before the throne of the Heavenly Father.